Players that give Amazon Queen a chance will find inside a design themed around the Amazonian jungle, its wild creatures and the queen mentioned by the title, though she’s more of a tribal warrior than a ruler like you might be used to seeing. The game was designed by WMS, which did a decent enough job with it, but the result is not as impressive as it would’ve been coming from another developer. If you load up Amazon Queen, you will notice 5 reels in the game, with 20 paylines on them. There are wild symbols, scatters, stacked symbols and free spins. As for the best prizes, at $2,250 they’re not exactly impressive. The features of Amazon Queen rely mostly on the wild symbol, on a scatter and on free spins. It’s not a feature rich environment unfortunately. The wild’s role has been taken by the symbol with the Jungle image on it. It is reserved for three reels, the 2nd, 3rd and 4th ones. When appearing there, the Jungle wild is capable of taking other roles, which should mean extra prizes that can be won by players, but not every single time it appears. There are only certain situations when wins are formed with the assistance of a wild, meaning that it has to be on one of the paylines where there are regular icons of the same type already. Another special symbol is the Gorilla, which appears stacked and which can form its combinations both from right to left and from left to right. The odds of big payouts being offered on multiple paylines are quite good. The Amazon Queen symbol is a scatter, and it’s the only one which the wild can’t substitute for. You can get it anywhere on the reels of the game, and as long as there are enough of them you can win free spins. You are offered 10 spins when three scatters are in place, 25 when there are four, and an impressive 100 free spins when all five are visible. You may cover with your wager as many lines as you want, but know that each line needs one coin when it’s active. You can’t use more coins per line, but you can modify the denomination within the given range, of $0.01 to $3. There is a maximum bet of $60 which can be used when all the lines are activated. If the Gorilla symbol forms a combo, and it typically forms more than one at the same time, you get paid 750 coins, meaning up to $2,250. The jungle theme insures that the design of Amazon Queen will feature plenty of wild animals that live in it, but there are also some symbols which are a bit different. You get the four card suites, with spades, clubs, diamonds and hearts being symbols present inside. The background image shows off some kind of temple hidden in the jungle. 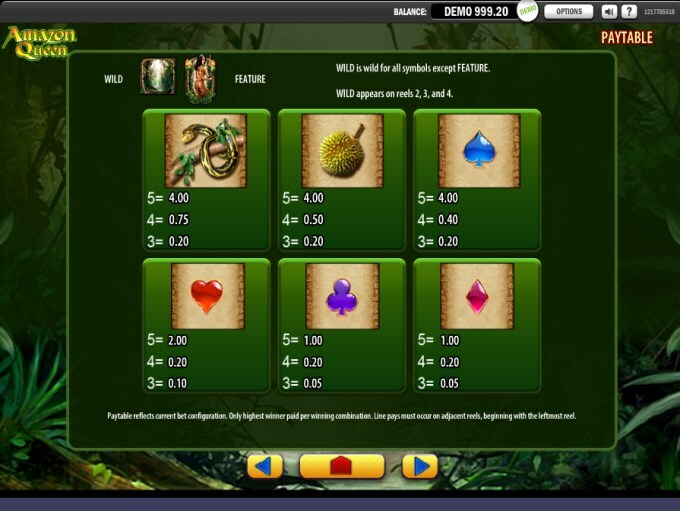 Symbols: Jungle (wild), Amazon Queen (scatter), Gorilla (750 coins), Tiger (600 coins), Parrot (600 coins), Snake (400 coins), Jungle Fruit (400 coins), Spade (400 coins), Heart (200 coins), Clubs (100 coins) and Diamond (100 coins). The jungle theme is quite common in slot machines, so that alone is not enough of a reason to play it. I enjoyed the way they give out the top jackpot, via stacked symbols, which could bring you multiple big wins at the same time. Amazon Queen can be found at any WMS casino, where you get a chance to play it for real money or in free mode.